How pleasant to come to church on a nice sunny morning and meet an old friend. Sometimes Sunday can be a jarring, discordant experience. You settle down in the pew only to be hit over the head by some unfamiliar and difficult hymn tune, or some disconcerting and discomforting biblical texts. Sunday can be an unsettling experience when poked in the ribs by the preacher whose sermon touches a sensitive spot and leaves you feeling uncomfortable, or expounds long and hard on an obscure biblical text that seems to have no relevance to your situation in life at this moment. Not this Sunday. The Fourth Sunday of Easter is known in the Church’s year as "Good Shepherd Sunday." The Psalm and the Gospel speak about sheep and shepherds, all pointing to the greatest shepherd of all, the Good Shepherd, Jesus. Today the psalm simply had to be the 23rd Psalm, the Shepherd Psalm. In fact, we are tempted to doze off at this point. This psalm has been a well-worn favourite with most of us to such a degree that it is in danger of becoming dulled by sheer familiarity. Perhaps you said "Oh no! Not the 23rd Psalm again!" as we sang the hymn "The Lord’s my shepherd". Another problem we have with this psalm is that it is often associated with death. This Psalm is often requested at death-beds and funerals and so we too often associate the 23rd Psalm with death and dying. When this psalm was written it was intended for the living, for those who have to deal with the difficulties that life can throw our way. It was written to remind us of the love and care that our God has for us in the good and days that make up our week. This is a psalm about living. This is a piece of scripture that is like a good friend – always ready to encourage, give confidence and the reassurance, promise help and support. What can this old friend tell us today? "The Lord is my shepherd. I shall not want." Most of us have learnt this psalm from a very early age. People who know very little about the Bible will recognise this piece of scripture – they may not know where it comes from but they know that it provides a helpful image that gives help and comfort. 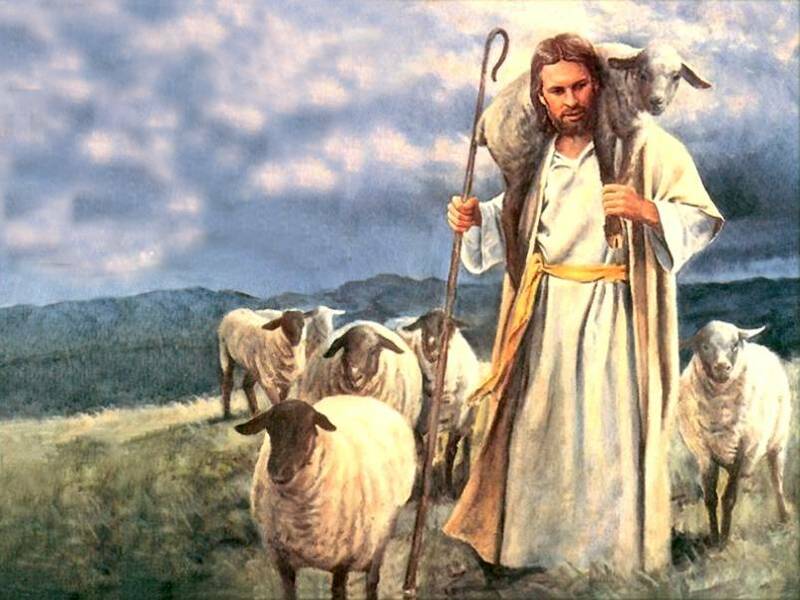 Most of us, I’m sure, have a picture in our minds that goes back to Sunday School days of Jesus, the Good Shepherd. I can remember the faded print hanging on the wall of my Sunday School room of Jesus carrying a lamb on his shoulders. You see similar pictures in almost every children’s Bible picture book. The image of the Good Shepherd can be found in the homes of the elderly. It expresses for them hope and confidence in their declining years. The image is one that all ages seem to be able to make a connection. It’s a simple picture, easy to understand. The picture of Jesus the shepherd tells us of something of the love, the kindness, compassion and gentleness of Jesus. When talking about our shepherd, Jesus, people express a childlike trust in God to protect us and take care of us. There’s nothing wrong with this – often it’s simple images like we have in Psalm 23 that are the most powerful when all else fails. Even when our minds become dull through sickness and old age the picture of the shepherd lovingly carrying a lamb is so clear. It's a picture of what Jesus is doing for us in our time of need. As we look at this picture, we see how relaxed and trusting the lamb is as the shepherd guides, seeks, leads, protects even carries the one so precious to him; we see ourselves as that lamb. "He makes me lie down in green pastures. He leads me beside still waters." These words are restful, reassuring. Even though I walk through the valley of the shadow of death, I will fear no evil. At the point of life when the darkness of death can tear from us those whom we love and we are standing at the grave of a loved one, or at that time when we are filled with all kinds of dread about the day when we will have to walk the roads of that dark valley, Psalm 23 speaks a word of comfort to our saddened and distressed souls. The Psalm dares to speak about the end of our earthly life and reminds us we do not need to take this walk alone. The Good Shepherd, Jesus, caringly and lovingly has paved the way for us with his own death and resurrection. The Good Shepherd is our resurrected Lord who is conqueror over the grave. Death is the beginning of a glorious new life with him in eternity. This Old Testament psalm reflects just this in its closing words. I shall dwell in the house of the Lord forever. This psalm not only talks about the way God cares for us at the beginning of our life with green pastures and still waters, but his care and love extends into all eternity. Even in those times of life when we wondered if God was really there, if he cared about us, if he really answered our prayers, if he really had deserted us and left us to the wolves of sickness, of unemployment, of trouble, the 23rd Psalm puts a comforting arm around us. It reassures us that we have a God who walks beside us and upholds us through all the trials and troubles of life and in the end we shall dwell with God forever. As often as I have read this psalm and preached on it, there is still something fresh I haven’t seen before, especially in the words: Surely goodness and mercy will follow me all the days of my life. These words tell us something about the Shepherd. A look at the Hebrew (the language this psalm was originally written) reveals, as is so often the case in the Bible, a word can be translated more than one way. "Goodness" means all those benefits that we receive from the presence of God in our lives. In the valley of the shadow of death it is good to know that God stands with us. In the face of every kind of trouble it is good that the Shepherd walks with us. As we face the future it is good to know the Shepherd will be with us. As we struggle with sin it is good to know that we have a Shepherd who has died for us and gladly takes away our sin. And we could go on talking about the good things that God brings into our lives. And "mercy"? That is a favourite word in the Old Testament (Hesed). The prophets loved to use this word. It is often translated as "steadfast love" or "loving-kindness". Here we are talking about the love of God that is faithful even when we aren’t faithful. This mercy or loving-kindness does not give up on us. In any and every circumstance of life, God’s Hesed is burning strong for us, it doesn’t give up, even though we might give up or feel like giving up in the face of seemingly insurmountable problems. Think of those times when everything seems to be going wrong for you, nothing is turning out right, and there is one disaster after another. You might think that God is a million miles away and doesn’t care about what happens to you at all. That’s not true! His Hesed, his "steadfast love", is right there with you even though you might not realise it. It was this Hesed (steadfast love) that sent Jesus to the cross to die for us, and to show us once and for all the greatness of God’s love for us. It is this Hesed of God (his love that never gives up) that is with you through every conceivable situation that comes your way and even though you might think the whole world is against you, you can be sure God is not. But now comes the word that is surprising. It is the word translated as "follow". Goodness and mercy follow me. This word in Hebrew gives us a bit more of an insight in to the word "follow". It also means "to run after", to "pursue". Goodness and mercy run after us, pursues us. The translation of this word as "to run after" or "to pursue" is used many times in the Old Testament. Just as Pharaoh’s chariot’s ran after or pursued the children of Israel to the sea (Ex 14.8) and David pursued his enemies (Ps 18.37) likewise goodness and mercy pursue us all the days of our life. The word "follow" can give us the idea that goodness and mercy is tagging along as we plod through life. "Pursue" has that added meaning that it will not give up. It will keep on coming, keep on chasing us, keep on running after us, through thick and thin until we find our eternal rest with God. Put it this way. There’s a difference between just walking along behind and being chased, or pursued. Pharaoh’s chariots were hardly cruising along behind Moses and the people of Israel, taking their time as if out on a Sunday drive. They were tearing along at top speed. This idea of God being a pursuer gives us a whole new look at our heavenly Shepherd. We see God running after Adam and Eve in the Garden of Eden after their Fall into sin. He came like a shepherd looking for his lost sheep, Adam and Eve. God kept on pursuing his people when they were disobedient and rebellious and kept on sending his prophets. In the New Testament, Jesus tells us the parable about the shepherd who leaves 99 of his sheep out in the wilderness while he goes out to pursue just one stupid sheep that has strayed from his flock. And he kept on pursuing that lost sheep until he found it. And he joyfully put it on his shoulders and carried it home and called together his neighbours to celebrate his success in finding the lost sheep. This kind of pursuing is quite unlike our experience. There often seems to be limits to the way our goodness and mercy pursues those who are lost. Maybe you’ve heard a similar conversation to this one, ‘You’ve done all you can for that boy. There are limits to what parents can do. He’s an adult now. It’s time for him to stand or fall on his own. Let him go’. Or when a member of our congregation falls away and doesn’t attend worship any longer, we don’t have the same kind of relentless following, or pursuing that Jesus has toward us. That’s not the way the Good Shepherd operates. He pursues relentlessly, without giving up, until he finds the one who is lost. But that is not the only lost sheep. There are other sheep who are lost. Jesus said, "I have other sheep that are not of this sheep pen. I must bring them also" (John 10.16). This pursuing shepherd goes out to bring in the lost sheep that are outside. They need to be brought into the safety and care that the shepherd provides. ‘I lay down my life for the sheep’, he says. Is there no limit to what this pursuing shepherd will go to save his lost sheep? Good old familiar, known-from-childhood Psalm 23 still has a powerful message for us today. At almost every corner of life this Psalm has something to say to us. Whatever our circumstances we are assured that the arms of the everlasting shepherd lovingly support and strengthen us in our weakest and most painful moments, as well as guide us and help us as we enjoy every blessing he has to give. That’s what makes this psalm about our Shepherd God so special and unique. The Good Shepherd will continue to run after us and his goodness and love will continue to pursue us through every situation and will never give up.